CAIRO: UN chief Antonio Guterres warned yesterday against growing hatred of Muslims, less than a month after a deadly attack on mosques in New Zealand killed at least 50 people. His remarks came during a speech at Egypt’s Al-Azhar, the Sunni Muslim world’s foremost religious institution, where he met Grand Imam Ahmed Al-Tayeb. “Around the world, we are seeing ever-rising anti-Muslim hatred, anti-Semitism, racism and xenophobia,” the UN secretary general said. He cited the March 15 New Zealand mosque attacks by a white supremacist as well as a 2018 synagogue shooting in Pittsburgh that killed 11 people and is believed to be the deadliest against Jews in US history. Guterres warned of a surge in hate speech he said was “entering the mainstream, spreading like wildfire through social media”. “We see it spreading in liberal democracies and as well as in authoritarian states.” Guterres is on a two-day trip to Egypt, “Islam is under a vicious attack aimed at accusing it of terrorism, while the most victims are Arabs and Muslims,” said Guterres. “The world is witnessing political wars that use religious and sectarian slogans to achieve different interests at the expense of the blood of innocent people, which should be taken care of,” he added. 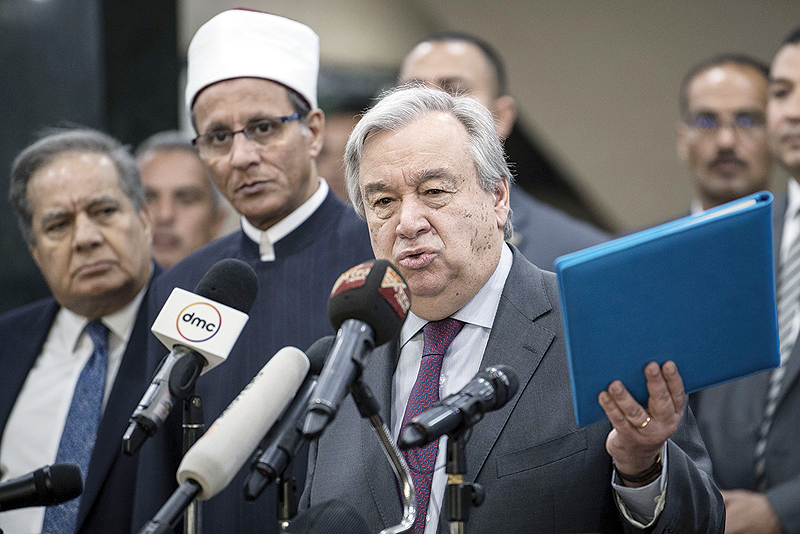 Guterres stressed the role of Al-Azhar as an important example of the true face of Islam, praising Al-Azhar’s initiative to open dialogue with religious institutions around the world, especially the Vatican, which will help consolidate peace and coexistence.